Increasing numbers of children are starting school life with communication difficulties. 10% of children and young people in the UK, a total of 1.4 million, have a speech, language, and communication need (SLCN). However in areas of disadvantage this figure increases, with up to 50% of children starting school speech and language skills that are significantly less developed than those of other children of the same age. 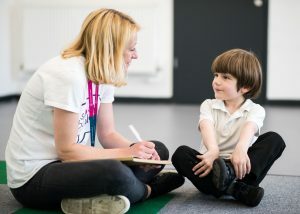 In Speech Bubbles sessions drama practitioners and school staff create a safe and playful space for children in KS1 to develop their communication skills. A story drama approach places the child at the centre of the activity, and they become at different times, author, performer and audience. Our Theory of Change illustrates the outcomes Speech Bubbles leads to. Speech Bubbles was developed in partnership with the Southwark Pupil Development Centres in 2009 and is now available to primary schools across Southwark, Lewisham, Lambeth and Greenwich with London Bubble and in Hackney, Tower Hamlets, Haringey, Tunbridge Wells, Oldham, Rochdale and Manchester with our partner organisations. A recent evaluation revealed that 85% of children participating in Speech Bubbles showed an improvement in learning, speaking and listening and 86% showed behavioural improvements. In 2018/19 Speech Bubbles sessions will be happening in the following Southwark primary schools: St James C of E, Albion, Grange, Haymerle, John Donne, Harris Peckham Park and Galleywall. We are continuing to develop the drama for communication work that began in partnership with Lewisham Arts Education Network with the Speak Out project in 2006. This year we are working in Myatt Garden, Kilmorie, Hatcham Temple Grove, Torridon, Brent Knoll, Invicta Deptford and New Woodlands primary schools. Speech Bubbles is delivered at Woodhill Primary School and Invicta School Blackheath in Greenwich. Thanks to funding from The Walcot Foundation London Bubble have expanded into Lambeth. In 2018/2019 Speech Bubbles will be running in Rosendale, Hitherfield, Elm Wood and Kings Wood primary schools. If you are interested in this programme of work please contact amelia@londonbubble.org.uk or call Amelia on 020 7237 4434.